In an ideal world, this weekend’s groundhopping visit would have taken me to an FA Cup match. Having managed to attend a match at a different ground in Sussex in each of the previous five rounds (including preliminary rounds) it had become my intention to keep this run going as far into the competition as possible. Alas, we don’t live in an ideal world. The fourth Qualifying Round would prove to be my undoing. Having already visited the ground of one of the county’s last two remaining clubs in the competition, Eastbourne Borough, in the previous round and with Worthing drawn away to Ebbsfleet (too far to drive due to my Saturday morning work commitments) my own FA Cup run has stuttered to a disappointing end. And with both clubs having now exited the competition just one stage before the First Round Proper, it’s a run that sadly won’t be revived anytime soon. And so to my next target for the season. To try and tick off a match at every ground in the Southern Combination Football League Premier Division by the end of the season (7 out of 20 so far this season, not including the grounds I’d been to prior to 2018/19). After a quick glance at the fixtures for this weekend, and indeed the coming weeks (I’m starting to plan ahead now… I take this stuff seriously, you know!) 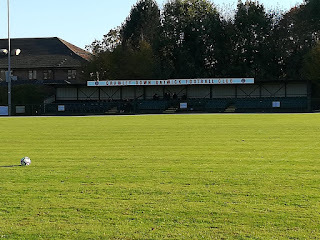 I decided to make this week’s groundhopping destination The Haven, home of Crawley Down Gatwick, for their league match against struggling Eastbourne United AFC. With my two sons opting to go swimming with the wife, rather than accompany me up the A23 to the village of Crawley Down, I was once again flying solo (sorry, I promise to keep the Gatwick puns to an absolute minimum) having just about recovered from the earache my youngest son managed to give me during our visit to Hassocks last weekend. I arrived at The Haven’s car park 20 minutes before kick-off and swiftly checked-in (sorry, I mean paid my £5 admission fee). Disappointingly there was no program available this week due to the man who ‘usually takes care of that sort of thing’ being on holiday. Never mind. These things happen. More of a concern, though, was when I entered the ground only to notice the drinks and snack stand was shut. Having been coaching all morning, I needed a caffeine fix! Fortunately, this situation was quickly rectified. Mere moments after I arrived the stand was open, and I was soon slurping greedily on a much-needed coffee. And from a proper mug! No paper cups at Crawley Down, don’t you know. As the ground’s name may suggest, The Haven, benefits from a picturesque, tranquil setting surrounded by trees on all sides. It’s certainly as pleasant as it sounds. That said, I’m from Newhaven, so it should be pointed out that not everywhere with haven in its name is equally pleasant and tranquil. There are two covered areas inside the ground. One small standing area behind one of the goals, and then a larger seated area, along the opposite side of the pitch to the dugouts, which consists of 74 seats (they were numbered, I didn’t count them, honest). However, with the mid-October sunshine feeling as warm as an early summer’s day, there was certainly no need to take cover on this particular visit. Who would have thought I’d still be watching football in a t-shirt with November creeping ever closer! With Eastbourne United entering the game very much bottom of the SCFL Premier Division with just a solitary point from 11 games and a goal difference of -29, upper mid-table Crawley Down were probably expecting a rather plane sailing afternoon (okay, I’ll stop with the puns now, I promise!). I know I was fully expecting to witness a fairly comfortable home win. 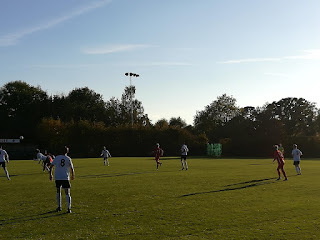 I must admit, my fears over how bad Eastbourne United could prove to be were not helped early on, when after just a couple of minutes a group of visiting fans who were standing to my left started shrieking with delight as one of their players crossed the halfway line with the ball. “All the way,” one of them screamed, somewhat optimistically. My fears, it turned out, were wildly misplaced. In a tight first-half of few clear-cut chances, United were arguably the better team and it took a good save from home goalkeeper Andy Greaves to prevent Charlie Ball from giving the basement side the lead. Crawley Down’s best opportunity in the first-half came through Oli Leslie, who headed weakly at Matt Dann from close range (see video). One player who really caught my eye in the first half was United centre back Ben Radley – and not just because he’s really, really tall. A couple of well-timed tackles and good composure on the ball certainly seemed to win the approval of the vocal Eastbourne following, who seemed to outnumber the home fans. In the second-half, the visitors continued to battle away, but other than an effort from the hard-working Ball, which clipped the outside of the post, they were finding it increasingly difficult to break down the home side’s stubborn and well-organised defence. Not that Crawley Down were creating a whole host of chances at the other end. They were barely threatening. 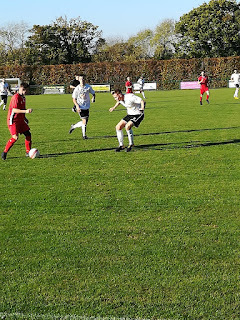 However, 15 minutes into the second half, poor play from Tyler O’Callaghan, let in Mike Spence, and the midfielder finished with aplomb past a helpless Dann to give the home side a hardly deserved lead. While the opening goal was by no means a catalyst for United to collapse, you could visibly see their confidence was shaken and more mistakes started to creep into their game. While they were still arguably enjoying more of the ball, they were also rushing passes more than they had been previously and were becoming increasingly less threatening. Crawley Down now looked totally comfortable. The killer second goal arrived just over five minutes from full-time, and again there was more than a smattering of Eastbourne shooting themselves in the foot about it. 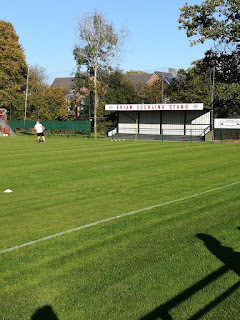 The linesman (sorry, referee’s assistant – I’m so old school!) flagged to award the hosts a free kick, but the ref waved play on. Believing the assistant had raised his flag to signal off-side, all of the United players virtually stopped playing, and following a good cross from the right an unmarked Leslie was left with the simple task of heading the ball into the net. This time he didn’t fluff his lines and the game was over as a contest. The visiting players and management team were visibly upset by the confusion caused by the flag being raised, but one of the first things we are taught as kids when we start playing football is to play to the whistle, and one feels that had the players adhered to this most cliched of clichés, then they may have been able to salvage something from the game. At 2-0, though, it was never going to happen. 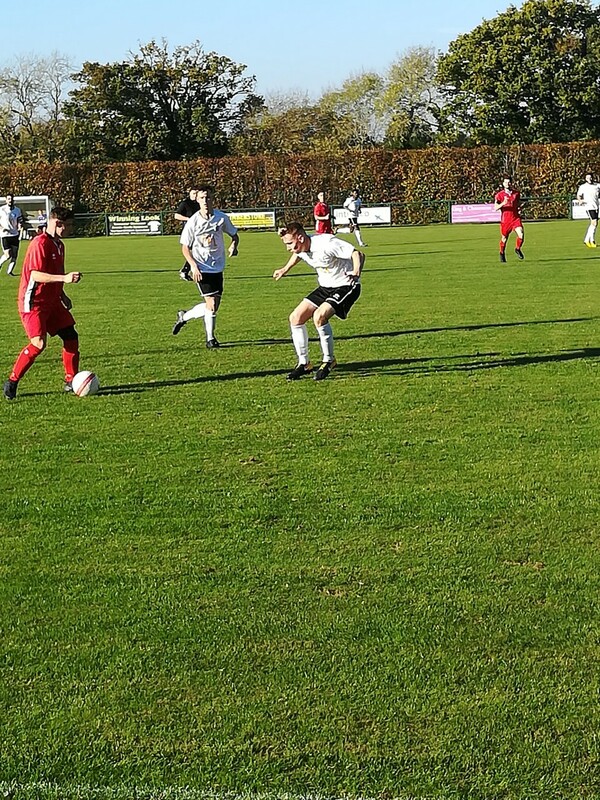 As if to prove that this was once again not going to be Eastbourne United’s afternoon, a final effort from long-range right on full-time clipped the top of the bar. 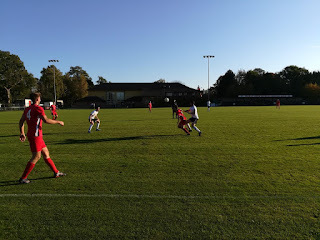 The final whistle was met by obvious relief from the home side, who were only too aware they had faced a far harder 90 minutes than they had probably expected, and dismay from the visitors who must be wondering what they have to do to start picking up points. Not a classic game by any means. But given the unseasonably warm weather, picturesque surroundings and coffee in a proper mug, I was more than satisfied by the afternoon’s entertainment.